Hawking specifically mentioned nuclear war, global warming and genetically engineered viruses as examples of human-made threats. 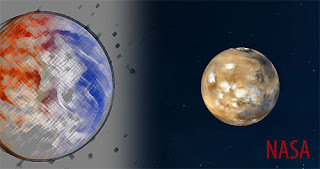 Colonizing planets is seen as a means of surviving, a point that Hawking also made in the 2011 documentary Surviving Progress4, saying this was our only chance. But now he explicitly identifies science and technology as responsible. There's your progress trap. In saying that we won't stop progress, or reverse it, Hawking is perhaps inadvertently revealing why science and technology may be our Achilles heel. History abounds with institutions that refused reform, and criticism. Athens prior to the Peloponnesian War, the pre-Reformation Church and the Soviet empire, to name but a few. Critics were seen as heretics and worse. These days, Science and Technology present themselves in many ways as beyond reproach. Thus Hawking's admission of their inherent dangers is a landmark event, for which he deserves the highest praise. To consider the learning process – that gave us Stephen Hawking – as something not applicable to the problem of progress traps just makes no sense. How do we have the brain power to do that? With 80 to 100 billion neurons in any given person's brain,6 and each neuron capable of making and receiving up to 10,000 connections, well....you do the math. by Daniel O'Leary FRSA. First published at progresstrap.blogspot.com - 23 Jan. 2016. * The Reith Lecture with Prof. Hawking - broadcast in 2 parts on BBC Radio 4 on January 26, 2016, and on Feb. 2, 2016 both at 9 a.m.